Bugeye here from Singapore ... just picked myself up a Canon S95 and keen to start making some home movies! I am new to the forum and am relying to introduce myself. Greetings from the Emerald Seas of British Columbia. After a long and loving relationship with my Oly 5050 and Oly PT-015 housing, I've taken the plunge and decided it is time to introduce my Nikon D90 to a few of the local critters. I'm starting from scratch with DSLRs underwater, but have jumped in with both feet and have ordered an Ike housing, 2x Ike DS-51 strobes, the 8" dome and the right port to match the 16-85mm lens that will be behind the dome. I really enjoy topside DSLR photography, so I'm hoping to combine a couple of my passions. Wish me luck. I'm off to Roatan (CoCo View) for a week, so I'll have lots of opportunity to practice with the new gear in shallow clear water. Hopefully one or two pictures are worthy of posting here. Fortunately there's a lot of similarity between using the 5050 on manual and a DSLR on manual (in terms of concepts and desired outcomes), so the photography learning curve isn't too steep. The new gear curve however, that's another story. Quick introduction: I'm Bert Stephani from Belgium: father of 3, occasional diver and professional photographer (on land). For the last couple of months I have been experimenting a bit with the combination of two of my passions: water and photography. I hope to learn a lot and get to know some nice people here. Been diving in aprox five years. Just upgraded my underwater gear from Fuji F10 to a canon 50D, but the housing is'nt dry yet. New to this forum!! Wow, I can't believe I haven't stumbled onto this before! I am a 54 yr old ranch foreman living in SW Washington state, and dive mainly in the Hood Canal and the Puget Sound with annual trips to Roatan and Vancouver Island. Been diving since 1972. Just got into taking pics 2 yrs ago. What a gas!! Edited by dany3, 27 December 2011 - 10:41 PM. I'm looking to start UW photography after diving for several years. Hopefully this is the start of a great new hobby! I'm new to forums and new to Wetpixel. I've been diving and taking underwater photos for 6 years now with my Olympus C-770UZ and a single Ikelite DS-51 strobe. I'm looking to upgrade to one of the Olympus PEN models and also need to replace my flooded strobe. So, I'm basically looking at buying a whole new rig and want some advice before spending any money. Just got my diving certification and am eager to start taking pics. I've got pics on borrowed cameras from the Maldives, Mauritius, and Seychelles, and hopefully, will be adding more destinations to that list in the near future. Especially interested in wrecks! Hi I'm Jose from UK. I've been diving for about 2 years and am interested in UW photography as a beginner. I started out late 2010 with a P&S (no strobes, nothing!) and despite my really basic equipment (FUJI F50FD) managed to take a couple of pics and vids that I liked in terms of subject and style. Clearly, I have much to learn though and since I am diving again in March have changed to a Canon G9 (so I can take snaps in RAW) and will take a strobe. I'll post to another thread soon as I could really do with some advise of how to get the most most from my limited equipment and how to find good quality, 2nd hand gear - especially Ikelite housing for the G9 - which is proving difficult. Looking forward to reading through these forums! I am new to the forum but I have been taken underwater pictures for a couple of years with a canon G7 + nikon SB105. I recently switched to a sony a55 and have tones of questions about how to use it properly! Hi I am a OWSI working in Maldives(TGI Diving, Constance Halaveli, North Ari Atoll). I'm Mike, an OWSI from Puget Sound, in Washington State. I've been shooting pics underwater for a couple years nows, purely on an amatuer level. I use a Canon G10 in a FIX housing, with Sea & Sea ys-90 strobes. I am Zaide from Malaysia. I love UW photography. I have been diving all over Malaysia, Indonesia and Thailand. My name is Mark and I'm new to underwater photography. I currently have a Canon 7D with a Nauticam housing. Looking at cutting my teeth with some natural light photography first, before splashing out on strobes, arms, etc. Hopefully I'll be able to contribute some useful posts as my experience grows. Hello Wetpixel!! Just another new member introducing themselves. I've been diving since 2003, am a PADI and SDI dive instructor who has been a hobbyist photographer for awhile, but just now really getting into it and working to improve my skills and overall photography. I am based in Los Angeles, and love the California kelp forests, even with the challenge that our conditions can lend to photography... that which doesn't kill you makes you stronger right? Looking forward to gaining new tips and sharing whatever wisdom I pick up along the way, as well as my photos! 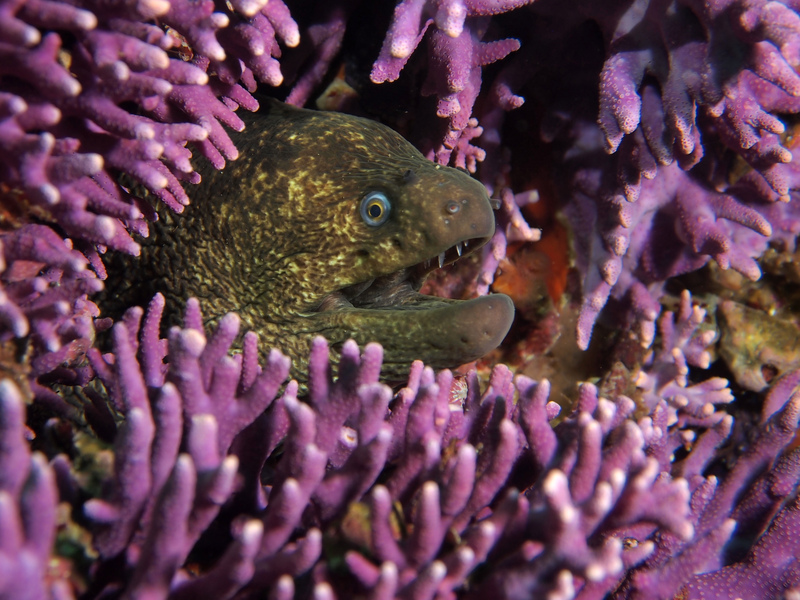 Here is one of my favorites, Moray Eel surrounded by purple hydrocoral on Farnsworth Banks, backside of Catalina. Hello all. I have been lurking for a while, but I finally might start posting. I am from Vancouver, B.C. & after diving for a while have decided to take up underwater photography. I have an EPL2, Oly housing and some other stuff.